It seems like only a few weeks ago that we were enjoying Verizon’s CES press event which featured its lineup of 4G LTE devices, all with front-facing cameras to take advantage of the newly announced Skype mobile with video. Oh how times have changed. And almost immediately after that news hit our inbox, the changing of HTC’s and Verizon’s sites started happening. The 4G LTE page for Big Red which used to feature its own Skype tab, was now missing for some reason. And then HTC took down their big Flash intro for the phone, only to bring it back within the last week; missing any reference to Skype of course. Finally today, some friends of ours reached out to show how their marketing materials had changed within the last few days. Stickers were being sent to cover up references to Skype on posters and other displays. 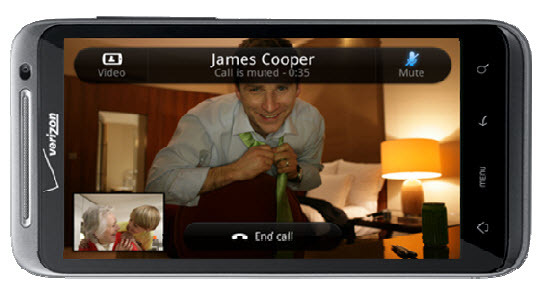 So will we ever see Skype mobile with video? You would hope so, right? The original plan was for it to be built into your Sense contact list to give you quick access to your friends with Skype, but that no longer appears to be the case. We’ll just try to hold out hope for a last minute change. Who doesn’t want some face time with friends from afar?